I don’t often write a post that doesn’t have a recipe involved…but this is one of those exception days. Remember I asked you all to sign up to my newsletter? Well thanks…you did, in such large numbers that I am not able to afford to send out a newsletter using that format. Hilarious right?? (Well not really!) We are in the process of figuring out how we send email for less to those of you who signed up. This is a good problem and if you have not signed up yet, feel free to still do so. You will automatically end up on my list and as a member of my new site when it finally arrives! Given that little sticking point, I had lots of great news in the last week or so, and no way to send it to you other than through Facebook, which as we all may know, is not reliable or user friendly in that there are people who don’t use it! (Good for you!) Either that, or settings are such that you do not see all of my feeds…you can change that you know. Anyhoo, back to the good old fashioned way; blog about it! Thanks for listening! BUT THE REAALLLY EXCITING NEWS is….my new ebook, What’s For Breakfast? is out and about and being used. I have had some great feedback already and if you haven’t already downloaded it, off you go. Also available in my online store, I do believe I have outdone myself with this book (Am I allowed to say that?) It has really been a creative process and a lot of fun to put together. I think I may have the hang of this recipe thing finally! For not much more than the price of a swanky dessert or a coffee and cake, you can have all these recipes at your fingertips, on whatever device you fancy. It is a PDF format, so easy to use, and pretty to look at or drool over! The contents of the What’s For Breakfast? ebook are listed below. 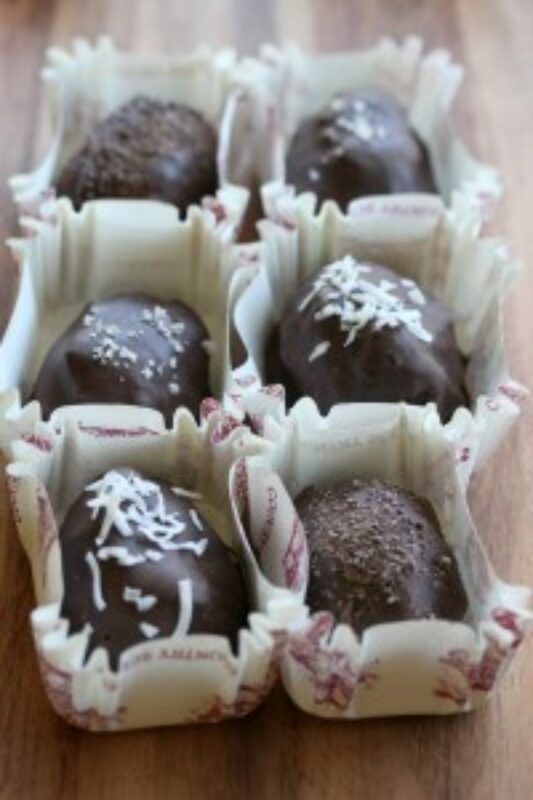 My favourites would have to be the Coconut Stuffed Chocolate Dates (OH yes, I did put chocolate into a breakfast book!) and the Crunchy Grain Free Granola is totally amazing…Actually I really loved the Cinnamon Crunch Cereal as well and the Coconut Berrylicious Bites (pictured) are pretty awesome…like I said, I enjoyed this project a lot. There are lots of savoury options, see the list below for exactly what, but the Spicy Maple Baked Beans are just AMAZING! I hope you will enjoy this book too, and then come back and tell me allll about it. Bon Appetit. Roasted Stone Fruit with Oat and Nut Meringue, Olive Oil Sea Salt and Chocolate Pancakes, Baked Eggs in Chilli Tomato Sauce, Coconut Waffles with Smoked salmon and smashed Avocado, Quinoa Cherry Friands, Coconut Stuffed Chocolate Dates, Crunchy Grain Free Granola, Breakfast Crostata, Brioche French Toast with Italian Meringue, Quinoa and Brown Rice Porridge, Instant Chia Cereal, Hazelnut Pecan Chocolate Scones, Coconut Banana Bread with Salted Caramel Mascarpone, SuperFood Quickie Brekkie, Fast Raw Muesli Bars, Raspberry and Ricotta Whip, Orange Custard Filled Brioche Tarts, Cinnamon Crunch Breakfast Cereal, Overnight Raspberry and Cream Cheese French Toast, Rosemary Fennel and Pork Sausage Patties, Coconut and Berrylicious Bites, Coconut Water and Crio Bru Horchata Smoothie, Fruit and Crio Bru Bread, Orange Sugar Danish Pastries, Trio of Jams; Strawberry Basil, Peach, Ginger and Peppercorn, Blueberry Lavender, Cinnamon Baking Chips, Almond ‘Porridge’ , and Spicy Maple Baked Beans.